Suicide Squad has a terrible assortment of conflicted characters, all hastily thrown together and then quickly disposed of as the film draws to a close. The movie begins abruptly, jolts through several action sequences, and ends before you know it. A glorification of comic-book villainy is probably what this one set out to be, but it ends up being a very confused film. Thus you watch the anti-heroes fight the good guys, and are directed to root for the former, but then the film explains why, and that spoils the fun completely. The plot is rather simple - outdated, even. June Moone (Cara Delevingne) is an archaeologist who's possessed by an otherworldly being called The Enchantress on an archaeological expedition. Amanda Waller (Viola Davis) recruits June and her partner, Captain Rick Flagg, on a covert intelligence operation, but June scoots midway, transforms into The Enchantress and summons her brother to help her take control of the whole world. The Enchantress then creates a formidable force of monsters who set out to wreak havoc everywhere. Amanda, not one to sit around twiddling her thumbs, has plans to fight fire with fire. So she recruits a bunch of imprisoned anti-heroes from a facility which they have been condemned to for life, plants bombs in their necks that will go off the minute they disobey orders, and places them under the charge of Rick. The anti-heroes eventually end up confronting The Enchantress, who can read their minds and offers them anything they want in return for their allegiance. Rick only wants June back. The film is quite episodic, and montage-like, occurring in little bits and pieces. Call it style, but a fractured narrative is all you can expect when there are a host of characters but nothing noteworthy happens in the movie. Several characters could have been better cast, and a few actors have absolutely nothing to do in the film. 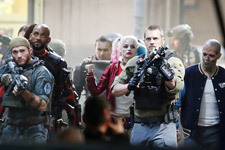 Yet, it is the performances that redeem the movie somewhat - easily a directorial embarrassment, the film is made even moderately watchable only by the portrayals of The Joker (Jared Leto), Deadshot (Will Smith) and Harley Quinn (Margot Robbie, who wins cheers from the kids every time she appears on screen). Cara Delevingne is also well-suited to the role she's been given. You also can't help wonder why the women in the movie are accomplished psychiatrists, intelligence agents and archaeologists - it adds nothing to the movie in a positive way. The film is also shockingly racist in several ways, suggesting that only white people go to Ivy League colleges, that Latinos are synonymous with Burritos (Jay Hernandez), and that Japanese women (Karen Fukuhara) are akin to Samurai. The music for Suicide Squad (Steven Price) is however a plus, as is the editing (John Gilroy) which keeps the pace going. On the whole, Suicide Squad is quite a gag-worthy film, really, and you could spend your time better. 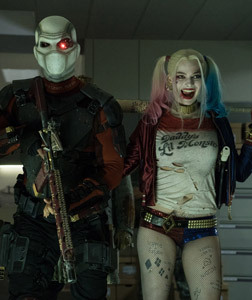 Be the first to comment on Suicide Squad! Just use the simple form below. fullhyd.com has 700,000+ monthly visits. Tell Hyderabad what you feel about Suicide Squad!